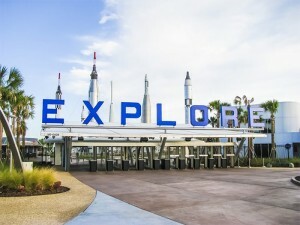 When Kennedy Space Center Visitor Complex near Orlando, Florida, reconfigured the entry area into the park, Electrosonic was charged with providing the audio-visual design, infrastructure, equipment and programming for the background music, audio messaging and video signage for ticketing and guest relations services. The project was the first from Electrosonic to implement QSC’s Q-Sys Digital Signal Processing (DSP) unit, which is billed as a powerful yet simple solution for audio processing, control and management. The Q-Sys CORE 3000 128x128 provides multi-channel audio playback park-wide. "Q-Sys offers a number of advantages to the Visitor Complex," according to Electrosonic commissioning engineer Tony Peugh. "With Q-Sys, you no longer need separate devices to play back the audio, eliminating the need for multiple CD players and solid-state audio playback machines, and minimizing the equipment footprint in the rack room." In fact, Electrosonic combined two EER rooms into one smaller space. "With this new configuration, 128 channels of audio are available, so you can tailor soundtracks to certain zones in the park by creating audio players in the software," Peugh explains. Q-Sys communicates over a network with Q-LAN "so any device can share audio, functions or information. As the park expands and upgrades, more audio can be added just by providing a network connection. It’s very simple and reliable, and could very well be the next big thing." "The new system also has green credentials," says Electrosonic project manager Gary Barnes. "It uses a lot less power than racks full of devices, so people concerned about LEED certification find Q-Sys a useful option." Electrosonic’s Design Consulting team was involved at the very start of the project, serving as the AV consultant to architects PGAV. Electrosonic’s Yiannis Cabolis was the designer of record. Electrosonic outfitted the retail building, Voyagers, with 11 QSC speakers and a subwoofer connected to amplifiers in the EER. Twelve QSC speakers were also installed in the entry/exit turn-style area, another dozen in the self-service ticketing kiosk area, and four, including two subwoofers, in the fountain area. In all cases, the audio sources for the speakers came from Q-Sys. Digital signage is prominent in several areas. The ticket stations and information area each feature two 32-inch high brightness, outdoor-rated LCD displays for graphics and information about tour packages and special events. Four QSC speakers and a paging station are included. The Welcome Center features an identical configuration and the ticket booths boast four LCD displays and eight speakers. In all cases, the displays are fed by a video player located in the EER via fiber with HDMI/DVI video and serial control. Audio is fed from the player to channels of DSPs and amps. Media is controlled by a media server application running on a PC in the EER; the displays’ start and end of day routines are controlled by the system controller running on the Medialon Show Control Machine. A covered, outdoor patio adjacent to the Rocket Garden featuring a new restaurant, the Rocket Garden Café, with counter service, has two 32-inch high brightness, outdoor-rated LCDs forming part of the scenic wall treatment. They display historical rocket and pop culture images from the 1960s. 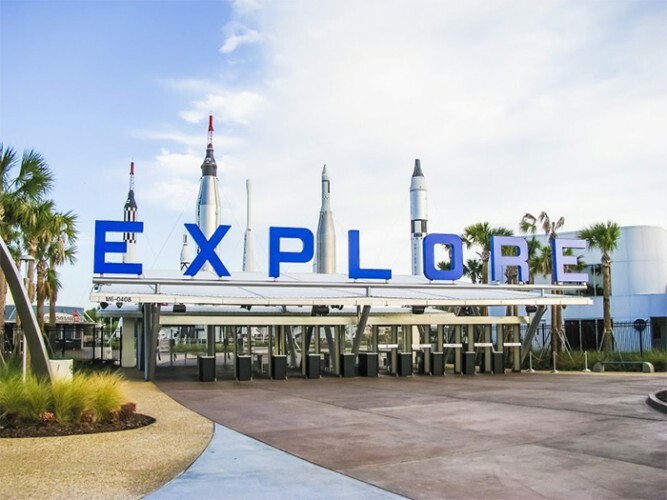 Electrosonic was brought on board the project by Delaware North Companies Parks & Resorts, which operates Kennedy Space Center Visitor Complex on behalf of NASA. Whiting-Turner Construction built the new entry area and worked closely with Electrosonic.